Letter Art, using our gorgeous collection of alphabet letter photos we can create a beautiful framed print or stretcyed canvas print with any wording required such as a loved ones name or a any other word required. Personalised name Art custom creation service, provide a name and we’ll create a stunning typographic artwork using their name. Our site has a assive range of fonts, colours and layouts available that all help to ensure that your artwork is of the highest quality. As with all of our bespoke art created for our customers, once an order has been placed and paid for, our team of talented graphic designers will create a proof within 48 hours for review, our customers can then feel free to request changes to this style such as moving words, changing colours or adding new words, we’ll send a new proof until our customer os totially happy with the design for their personalised name art. 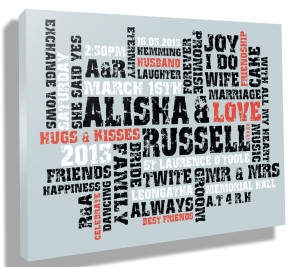 Order a beautiful name art piece here.